Grand Rapids car owners know that even a minor collision can put a large dent in your bumper — and in your wallet! Our full-service Grand Rapids body shop specializes in quality collision repair at a fair price for all makes and models of cars and trucks that have been involved in an accident. The expert technicians at O’Neill’s Body Shop can handle any collision-related vehicle repair — from minor scratches and dents to major structural repairs — to help you get back on the road quickly. No appointments are needed, just bring in your damaged vehicle and we will be able to get you a quick estimate. When O’Neill’s Body Shop was founded nearly 50 years ago, cars were made of steel. Today’s vehicles are made from a wide variety of materials such as steel, aluminum, plastic, carbon fiber and advanced alloys. In addition, cars have become more sophisticated with high-end technology such as on-board computers, multiple air bags, anti-lock brakes, hybrid engines, laser cruise control and navigation systems. That is why we have continually invested in new technology to be able to safely and efficiently repair today’s most advanced vehicles. 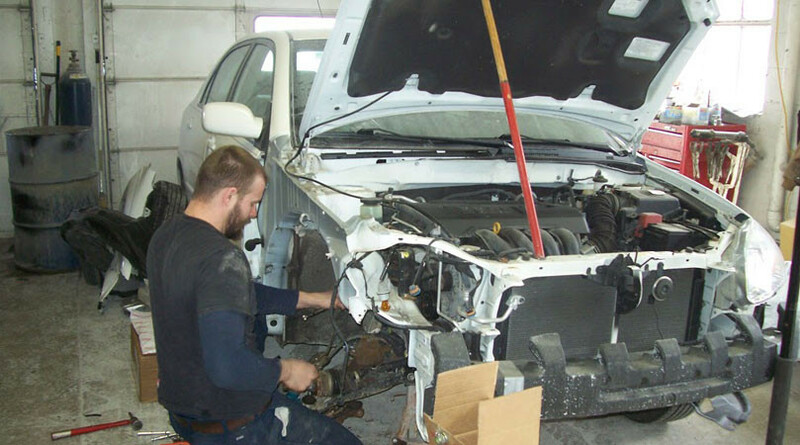 The collision repair technicians at our Grand Rapids auto body repair facility know from experience that to complete a great repair, they need to put a great finish on the repair. That is why O’Neill’s Body Shop is proud to use an environmentally friendly paint system with low emissions. This allows O’Neill’s Body Shop to provide you with an outstanding finish that’s better for you, your vehicle and for the environment. When you’ve been in an accident, O’Neill’s Body Shop will help to minimize the stress, hassle and cost of your collision repair — and get you back in your car and back on the road quickly. For nearly half a century, O’Neill’s has been a name you can trust for collision repairs in Grand Rapids, MI. For more information about the auto collision repair services at O’Neill’s Body Shop, please contact us here or call us directly at 616.949.6840.